TOKYO, Japan — Earlier today, members of Japan’s Kuudere population converged on Tokyo to rally at the nation’s Diet building to demand better representation in modern anime. The rally, which consisted entirely of seven dozen people sitting and quietly reading books on the Diet building’s steps, lasted for several hours before everyone involved packed up their blankets and science fiction novels, and left without saying a single word. While eyewitnesses at the scene of the rally related after the fact that they were unsure exactly what the many blue-haired young women had hoped to accomplish with their quiet sit-in, pamphlets found at the scene of the rally afterward explained that the group’s primary objective is to fight for better and more positive representation of Kuuderes in anime and that they should be given roles beyond those of stoic bookworms and dysfunctional robots attempting to learn what it means to be human. 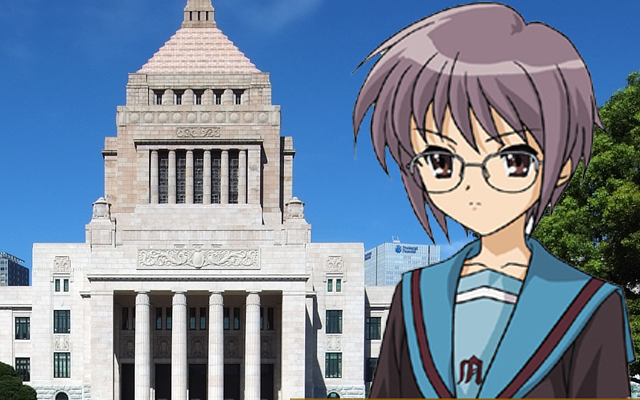 Other minor goals of the Kuudere Liberation Front, as the group calls themselves, include educating the public on various Kuudere related social issues, and speaking out against the harmful rumor that all Kuuderes are in fact clones of NERV scientist Yui Ikari. “We’re not all robots….” Ruiko Hamasashi, the blue-haired leader of the KLF, said plainly in an exclusive statement to Anime Maru. “We have emotions and hobbies like everyone else, and the people need to realize that and stop stereotyping us…” When asked if she wished for more anime to reflect the diversity of Kuuderes today, Ruiko nodded quietly and then returned to reading a book by American author Issac Asimov. News of the rally has spread like wildfire across the Japanese social media sphere and has prompted many other -dere groups to plan rallies of their own in support of better representation in modern anime. As of writing, Japan’s Tsundere population has been among the first to plan such an event with their “It’s Not Like We Want You Guys To Put Us In More Anime Or Anything, Geez!” rally currently slated for the 5th of October.